Modifiers are words that people write onto a base keyword when trying to find relevant search results in search engines. They can be adjectives, verbs, shopping terms and anything else to bring back more relevant search results. You can add relevant keywords to a particular topic to produces more accurate long tail keywords. Adjective modifiers are ideal for shoppers. This kind of modifiers helps to narrow down searches by using comparison modifier. You can use these to get people in the in the research process in your copy. By using that, you can also help to reduce ORM issues. Top: This can be the same as best with the top (insert service or business) in XYZ city or another end modifier. It can also be used for product quality such as top cities with beaches. Buy: This is one of the more typical shopping for shopping related sites. Cheap – This is also a great modifier to narrow down the search for shopping. You can get regular visitor and reader by using cheap within your copy as a modifier for google. Color and style modifiers for SEO are helpful for e-commerce stores and affiliated sites. These keywords help to reach people looking for specific products because they add more relevance to the search query. Pages that are a search engine and user-friendly with perfect color and style modifiers get better-targeted traffic. Blue, Green, etc: With color modifiers like blue and green, you can create comparisons of sizes, Colors, stores. Different Sizes: Adding different sizes would be a plus point. Sizes like plus size, small size or other specialty sizes would ask the search engine to find for that specific content. Brand names: Adding brand name is essential if you have online stores. XYZ brand widgets are helpful as it helps to get some of their traffic which further and this further contributes to driving more sales. Where is the best place to find: Perfect for e-commerce stores and Affiliates. How do I build or make: These are ideal for Bloggers with a resource section. What is the best: These modifiers are perfect for service providers and Affiliates. Where can I: This is ideal for shopping, finding information and pretty much everything else. How to build or make: These are perfect for bloggers and DIY stores. SKUs, model numbers, the style number, the year it was created, materials the product uses or is made of, Version number and Prices. 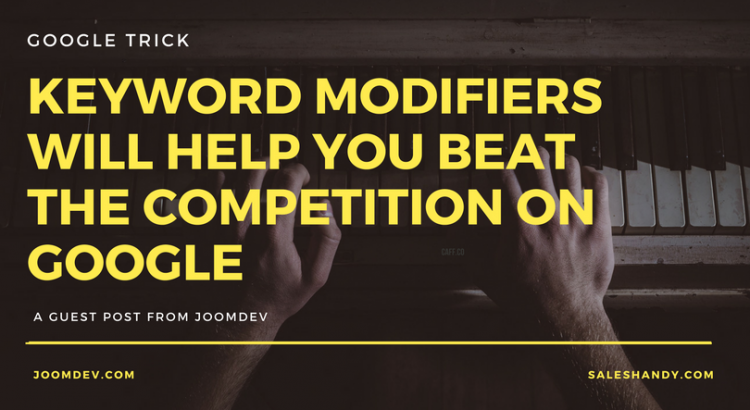 There are lots of other modifiers you can use to beat the competition and drive more traffic. Below are some of the popular modifiers which can also be used in some of the categories listed above: Coupons, Holidays, Cities or locations etc. Say your main keyword is Mobile Phone. If you look up Mobile Phone, you will see that there are around 100K searches per month! Now, if you are selling Mobile Phone, then you might be thinking this is an excellent keyword, right? No, you are wrong. Well, let me explain why. It is a highly competitive keyword that most stores selling Mobile Phone are using this for. It is not very specific (If someone is using it on Google, they would be confused with the search result). Let’s go a little bit deeper. Now you modified the keyword with Best Mobile Phone. Now the google search will bring down the result to only 10K only! You will start to get people who are looking to buy. After all, they are now looking for the “best” Mobile Phone, so they are probably shopping for some Mobile Phones, right? Well, this is not also an exact keyword you should use. What if, you use Best Mobile Phone For Selfie (1K searches a month). With it, you have a far lower volume keyword, but it will also have far less competition. Anyone using this keyword in Google can also be treated a seriously focused buyer. A person who likes selfie and looking to buy some mobile phones, right now! Adding such modifiers will make your keywords long-tail that mostly have less competition. Finding long-tail keywords manually has never been easy. Tools like LongTailPro will help you out in this by finding relevant long tail keywords. Using these Keyword Modifiers as a technique is a powerful tool for creating large pieces of keyword combinations. Without them, it’s hard to be cost-effective when optimizing an extensive website for campaigning on google. Also, using this method will allow you to get a large site optimized quickly so you can start to see the benefits sooner. You can then work back to the site manually, reviewing pages and adjusting this technique to optimize as necessary. How to Maximize Your SaaS Company’s Growth?